1.It is indeed a privilege to address this distinguished assembly of Vaidyas and practitioners of Ayurveda. I would like to, first of all, congratulate the All India Ayurveda Mahasammelan and Vidyapeeth for organising this 58th All India Convention on Ayurveda and providing an important forum for the experts in this field to exchange views, deliberate on the modern application of this ancient science and collectively address the task of promoting its use. 2. 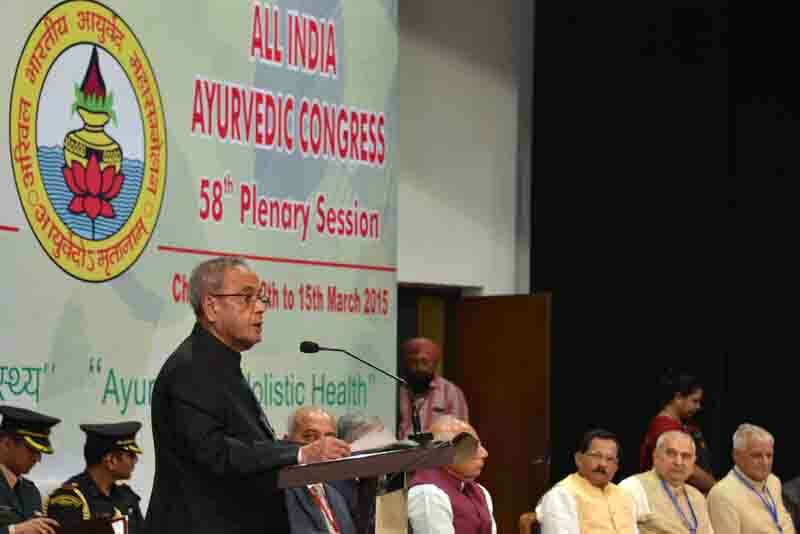 Ayurveda, as a science, belongs to India. It is the oldest surviving system of medicine in the world. Its origins have been traced back more than 5000 years. It is believed that the concepts of Ayurveda were known to the people of the Indus Valley Civilization. The science was significantly developed during the Vedic period of our history. In fact, the main source of knowledge in this field are the Vedas – particularly the Atharvaveda believed to have been written around 1000 B.C. We know that in the 5th Century the erudite treatises of the greatest of our Vaidyas, Sushrutha and Charaka were translated from Sanskrit into Chinese and in 700 A.D. Chinese scholars were studying medicine in India at the University of Nalanda. By the 8th Century, these texts were translated into Arabic and Persian. We see that Arabic works derived from our Ayurvedic texts reached Europe by the 12th Century. Today, it is a matter of satisfaction that Ayurveda has not only sustained itself in many of the countries of South Asia, but is also popular across the seas in some of the countries of Europe and in the United States of America. 7. For too long has Ayurveda been dismissed as an ‘unproven’ discipline. I would like to see Ayurvedic medicine being demystified and popularized through informative marketing and user friendly packaging; I would like to see the day when we have mobile clinics delivering Ayurvedic treatment and medicine through the villages in all parts of India. I would particularly like to encourage the youth of India to study, safeguard, practice and propagate this ancient knowledge system. 8. It is believe that centuries ago, the medicinal systems of Ayurveda and Siddha had laid down protocols for successfully treating diseases that resembled the diseases that we know today as HIV and tuberculosis. If these remedies could be researched and the findings pursued, they could bring new hope to millions and revolutionize modern medicine. To achieve this, I would like to see greater collaboration between ayurvedic and allopathic researchers to widen the database of treatment protocols and successful medical practices for the benefit of our people. It would also be appropriate to establish channels of direct connectivity between Ayurvedic laboratories and drug manufacturers. Some modern hospitals are additionally offering Ayurveda in the name of integrative medicine. I would definitely encourage hospitals all over India to add the facility and service of Ayurvedic treatment in whichever way they can. In the same context, the importance of Yoga has been acknowledged for protecting health and curing disease. This year, the United Nations adopted without a vote, a resolution, declaringJune 21stas International Day of Yoga, recognizing that "Yoga provides a holistic approach to health and well being”. As Yoga and Ayurveda are complimentary to each other - and the practice of Yoga can increase the beneficial effects of Ayurveda – a combination of yoga and ayurveda can go along way in giving good health and preventing disease.